Elizabethtown Tenn. – TN — Throughout Friday and Saturday, eight teams participated in the Milligan Mountain Madness, a volleyball tournament put on by fellow Appalachian Athletic Conference school Milligan College. While St. Francis (Ind.) was the only competitor to see a perfect 4-0 weekend, University of the Cumberlands (Ky.) trailed with a 3-1 record and was followed by four others that included Bryan, Milligan, Asbury (Ky.), and Union (Ky.) who split finishing 2-2. University of Pikeville (Ky.) ended 1-3, while Midway (Ky.) came up empty-handed at 0-4. The Lions were able to improve their overall record to 3-5. To begin the event, Bryan met up with one of the more skilled teams in the Cumberlands Patriots. In Friday’s opener, the Lions had their best set against the Patriots in the opening frame as they battled back from 21-15 to tie the score late at 23-23. A combined block by Rebecca Camacho and Paige Randolph helped Bryan gain their first edge of the set at 24-23. Unfortunately, the Lions were unable to seal their closest set when the Patriots rattled off three straight kills to come back and take the set 26-24. Set two saw Bryan off to a slow start, trailing 7-1 and then 14-7. Cumberlands allowed Bryan to only reach 13 in the second frame, as the Patriots took command of a 2-0 lead in the match with a 25-13 second set victory. Despite Cumberlands being a tough side, Bryan would not back down easily, as the Lions fell behind 10-5 but would slim the margin back to two points at 14-12. The Patriots responded with three points, but a kill by Mariah Dunlop and service ace from Randolph made it a two-point difference once again with the count 17-15. While Bryan made a good run, Cumberlands would only surrender three more points to the Lions as they won the set 25-18 and the match 3-0. After the Mountain Madness, Cumberlands improved their mark to 5-4 on the season. The negative attack percentage hurt the Lions, while the Patriots were on the positive side with a .211. Leading Bryan’s attack was Randolph with seven kills, followed by Dunlop and Anna Owens who registered five kills apiece. Camacho ended with three put-aways, and Janie Smith saw a pair of kills. 19 of the team’s 21 assists were tallied by Jennifer Keck. Macenzie Krause, Randolph, and Owens each had one ace, respectively. Randolph and Rheagan Kean matched each other with a team-high 11 digs, trailed by Keck with 10. Camacho led the squad with two block assists. Bryan ended the first day on a high note when they were the start of a three-game losing streak for the UPike Bears. Pikeville, who had captured a 3-1 win over Midway earlier in the day, wasn’t able to escape the claws of the Lions as Bryan battled for a quick sweep. Bryan owned an impressive .302 attack percentage in the match with the duo of Dunlop and Owens leading the way. Dunlop smashed 15 kills on 29 attempts for a .483 average, and Owens was successful on 11 of 18 kills for a staggering .556 attack percentage. The two combined for 26 of the team’s 40 total kills in the three sets. The assists’ leader was Sidney Pierce with 19, followed by Keck with 13. The Bears struggled to return the serves of Pierce and Krause as each had three aces apiece. The only Lion with double-digit digs was Kean with 15. Keck and Joslynn Mendoza aided with seven digs, respectively. While impressing on the offensive end, Dunlop also got work done defensively above the net, rising up for two solo blocks and two block assists. MyKayla Hampton was efficient during her time on the court when she went 3-for-6 on kill attempts while chipping in a trio of block assists. It wasn’t the start that Bryan was looking for in set number one when Pikeville ran away with a quick 4-0 lead, but two service errors by the Bears sparked a rally for the Lions. An attack error by Pikeville, a kill by Dunlop, an ace by Pierce, and back-to-back attack errors by the Bears put the Lions ahead 7-5. Despite the momentum shift, Pikeville was able to answer back and retake the lead 10-7 with five unanswered points. Instead of getting down on themselves, Bryan remained positive and would piece together the game changer off a 9-0 run to claim a 16-10 lead. Pikeville couldn’t handle the surge by Bryan, giving way to the Lions taking the opening set 25-17. The Lions and Bears stayed close in the beginning of the second set with Bryan carrying a slight 9-7 lead, but Bryan ended all hopes of Pikeville with an 11-2 run that catapulted them in front 20-9. Leaving no chance for the Bears, the Lions took the 2-0 match lead with an overwhelming 25-13 second set. Once again, the third and final frame was all Bryan when they turned a close 10-7 advantage into a comfortable 17-10 lead. A kill by Dunlop, service error committed by Pikeville, and four straight attack errors by the Bears left the Lions in search of two more points to end the contest. The first came on an assist from Pierce and kill by Dunlop, and the second was another assist from Pierce but this time the put-away was by Hampton to end the set 25-15 and the match 3-0 in favor of Bryan. UPike ended the event 4-6 overall to start their season. Saturday tipped off for Bryan with a meeting against Asbury where the Lions would struggle in a middle set but go right down to the line with the Eagles in sets one and three. While Bryan never saw the lead in the opening frame, there were six tied points, including late when the set was deadlocked 15-15. Three consecutive kills by Asbury were all they needed to separate themselves from Bryan and battle for the 25-19 first set win. A slippery start to the second set left the Lions trying to play catch up against the Eagles with a score of 10-5 early, 14-7 later, and then 20-11 just before Asbury claimed the 2-0 advantage in the match with a 25-12 second set score. Bryan was just one point away from Asbury with the count 11-10, but the Eagles soared for a 9-3 run to push their way in front 20-13. The Lions didn’t go down without a fight, as they added six more points to their total but were unable to before the Eagles took the set 25-19 and the match 3-0. In the match, Bryan barely stayed positive on the attack with a .064, and was led by Dunlop and Owens with six kills apiece. Pierce totaled eight assists for a team-best, while Keck followed with six. Krause combined for a whopping four aces and 10 digs, but the digs’ leader was Kean who scooped up 11. Bryan out-blocked Asbury 5-3 with two block assists from Hampton, Camacho, and Jessi Towe. Dunlop led the way with three block assists, and Owens aided with a lone block assist. The Lions ended their time at the Mountain Madness on a positive note in a three-set clean sweep of the Midway Eagles, led by Dunlop once again tallying 10 kills on 22 attempts for a .364 attack average. Emalie Hicks impressed with eight kills and a .200 average, and was followed by Owens with seven kills, Camacho with four kills, Keck with three kills, and Smith with a pair of kills. The Lions outhit the Eagles 34-28 and owned a .188 attack percentage as a team compared to Midway’s .037. After being tied 5-5 in set number one, Bryan blew past Midway in commanding fashion with 10 unanswered points for a 15-5 lead and never looked back. The Lions allowed five more points to the Eagles to put the score at 20-10 before surrendering another five, which had Midway at 15 before Bryan ended the set from a service error committed by the Eagles, 25-15. Midway managed to scrape out a 13-10 lead in the middle frame, but a kill by Owens, a service error by the Eagles, three attack errors by the Eagles, a set error by the Eagles, and an ace by Mendoza propelled the Lions in front 17-15. Once Bryan established an advantage, Midway would never see a glimpse of the lead again as the Lions cruised for a 25-19 second set win and 2-0 match lead. Bryan’s final set of the tournament would be a tug of war, having both sides compete for 14 tied points, four lead changes, and the largest lead by either side being a meager three points. Midway through the frame, the Lions and Eagles were tied 11-11 and then 12-12, but Bryan used two attack errors for a 14-12 edge. The advantage was short-lived with Midway coming back and tying the set 14-14 and then rallying for a 17-14 lead. The Lions repaid the Eagles with a 5-0 run that put Bryan back on top 19-17. The Lions owned the lead until the Eagles swept in and tied the stanza 21-21. Dunlop took an assist from Keck and hammered down a kill to give Bryan a 22-21 lead. Once again, a tie was created at 22-22 when Midway recorded a kill. One more kill from each side, Bryan’s being another from Dunlop, moved the count to 23 apiece. A monster kill from Smith left the Lions in need of just one point, which would come from an attack error committed by the Eagles, providing Bryan with the 25-23 second set victory and 3-0 sweep of Midway. The Lions keep the Eagles still in search of their first win of 2018 with Midway owning a 0-4 overall mark. 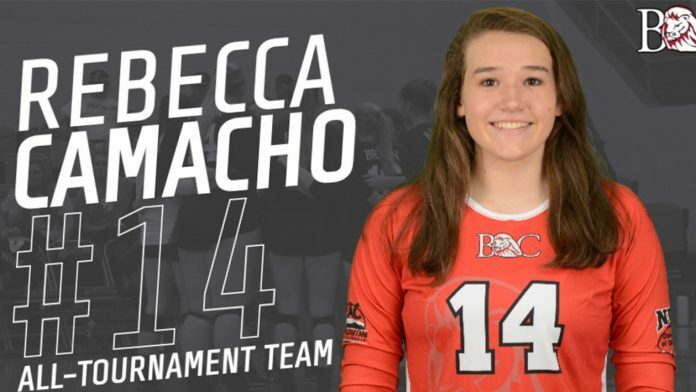 Camacho, a freshman middle blocker from Asheville, N.C., was Bryan’s representative to the Mountain Madness All-Tournament Team, as she totaled 10 kills through nine total sets for a 1.1 kills per set average, having not played in the UPike match. She had a positive attack percentage of .218 while aiding with a pair of assists, five digs, and five block assists. With two road tournaments under their belt, Bryan will return home on Thursday, Sept. 6 at 6:30pm for their home and AAC opener against conference rival Tennessee Wesleyan University. Follow the Bryan Lions Women’s Volleyball team on Twitter @BryanVolleyball, Instagram @bclionsvolleyball, and Facebook @bryancollegevolleyball.